Classical guitarist John Waldo has performed with the Springfield Symphony on public radio of the Ozarks. He has performed as soloist with the Stanton Strings of Springfield, Missouri and the Trinity Recorder Consort of Madison, Wisconsin. Waldo has made multiple appearances on network affiliated television and has performed live “In the Spotlight” on Wisconsin Public Radio. Waldo performed his Christmas program on “Studio Live” with Public Radio of the Ozarks and has appeared on multiple occasions as Featured Guest Artist for the Children’s Choir of Southwest Missouri. Since his academic recitals as an undergrad and graduate student, he has appeared in hundreds of concerts, recitals, weddings, worship services, and social events. His performance schedule has taken him through much of the United States and parts of Europe. 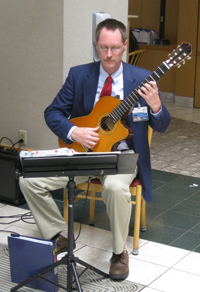 John Waldo regularly volunteers his musical talent in hospitals and cancer treatment centers as part of the program, “Healing through Music”. Waldo has served as Artist-in-Residence at Sequiota Elementary School in Springfield, Missouri, where he directed a school-wide professionally produced studio recording project for over 200 elementary students. 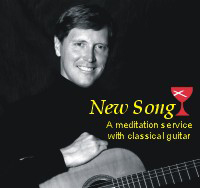 He also served as resident guitarist for “New Song,” a weekly Taizé style meditation service featuring classical guitar. Waldo has presented his innovative program of poetry and classical guitar, “Celebrate the Earth” for dozens of public and private schools, libraries, festivals, and charities. He has performed his non-denominational guitar worship setting for scores of churches which also serves as the instrumental basis of his solo release, “The Glorious Guitar”. Waldo is a member of the Grammy Academy® and the Guitar Foundation of America. He is founder and past president of The Guitar Society of the Ozarks, which merged into the Springfield Federated Music Club of which he is past president. Waldo has taught at the university level as well as in his private guitar studio and has adjudicated for Federated Festivals . As presenter Waldo coordinated appearances by Lily Afshar, Oscar Ghiglia, Douglas Niedt, Paul Henry, and Evangelos and Liza. He has performed in master-classes with many of the guitar greats of the preceding generation. Waldo studied guitar at the undergraduate level with Peter Lingen and then with Javier Calderon while completing his master of business administration. "Mr. Waldo's musical performance was technically perfect and created an aura of peace and tranquility throughout our audience." 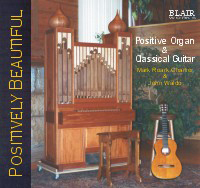 Waldo's collaborative recording, "Positively Beautiful - positive organ and classical guitar" on the Blair Works label has been broadcast on classical music stations throughout North America. 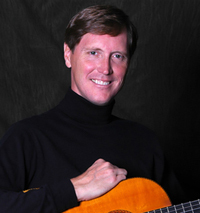 His other albums include his live performance of the "Partita Concerto" for guitar by Andrew Charlton; his release of standard guitar solos, "The Glorious Guitar"; his arrangements of traditional Christmas carols for gutiar, harpsichord, and positive organ on "Christmas Classical Guitar"; and most recently, "It Is Well: Great Hymns on Guitar". 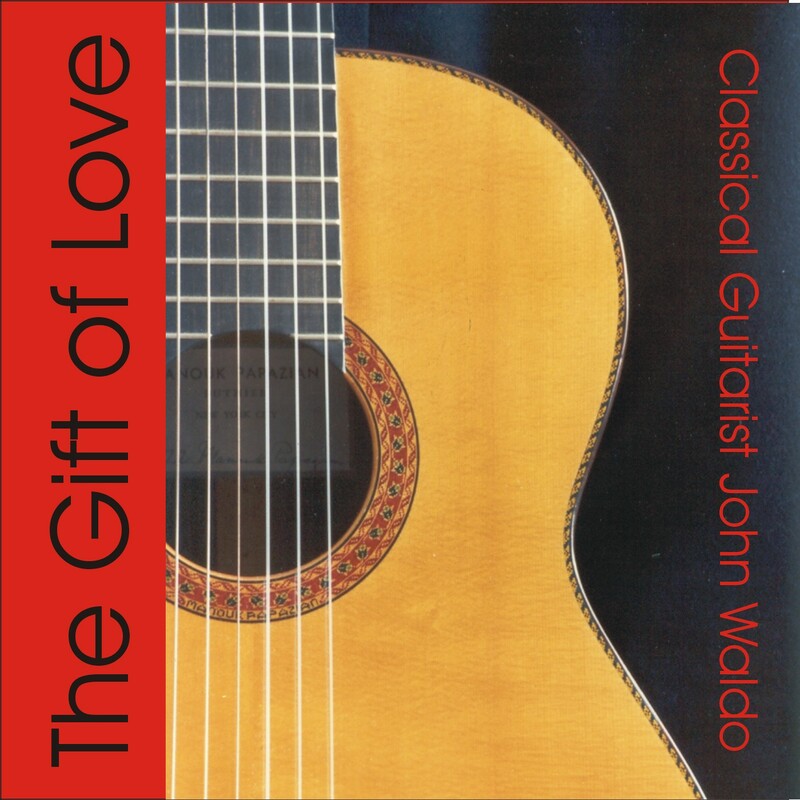 John Waldo’s "Christmas Classical Guitar" recording is a wonderful album of instrumental Christmas music. 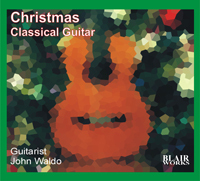 It is a classical guitar Christmas album that features traditional carols with guitar accompanied in new settings of harpsichord and positive organ. It is available as a Christmas CD or as an MP3 download. Packaged in an eco-wallet, it can serve as a musical greeting card with space to write a Christmas greeting. It is soothing, relaxing, simply gorgeous Christmas music. Hopefully you will find it one of the best collections of instrumental Christmas carols available this year. Enjoy. 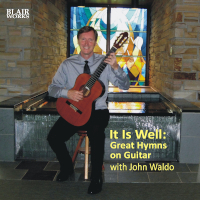 It Is Well: Great Hymns on Guitar is unique in that it presents in a single volume a remarkable collection of popular hymns. At least one from the collection is heard in many traditional worship services. They are arranged with consistently exceptional musicality. Organ builder and organist Mark Roark (ROE-ark) Chartier (Shar-tee-AY) and classical guitarist John Waldo blend the flute-like tone of the positive organ with the plucked strings of the classical guitar, creating an effect which is "Positively Beautiful". This perfectly balanced pure acoustic CD includes works by Granados, Giuliani, Sanz, Handel, Sor, Tárrega, Beethoven and others presented with brief and lucid program notes in an attractive six panel digipak. "Positively Beautiful" began with an impromptu visit by John Waldo to the Mark Roark Chartier workshop to view an 1822 flute-playing clock under restoration. The two performers sat down in the confines of the workshop to play through some early duets scored for recorder and guitar. With Mr. Chartier at the positive organ he had recently built and Mr. Waldo playing the guitar, it was immediately apparent that a truly sublime combination had been found. Since then, the primary emphasis of the duo has been to showcase the exquisite voicing of the ensemble. Their album presents the very best renditions of their arrangements for these exceptional instruments, creating an effect which is... "Positively Beautiful". Mark Roark Chartier is both instrument builder and performer. He holds a Master of Arts degree from the University of California where he was active in the early music ensembles. He spent ten years in Spain and Poland restoring historic pipe organs and giving concerts of early music. In addition to the positive organ used on this recording, Mr. Chartier has built numerous other instruments including harpsichords, clavichords, a psaltery and did the complete restoration of an early nineteenth-century flute-playing clock. A positive organ derives its name from the ability to move, or posit it. Mr. Chartier is also the composer of several of the works on "Positively Beautiful". 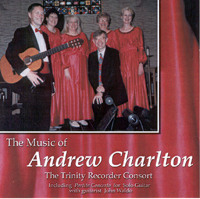 The Trinity Recorder Consort and guitarist John Waldo capture a select collection of the works of Andrew Charlton (1928-1997). A true renaissance man, Charlton was, according to colleague David Grimes, an original composer, an unusually skilled arranger, and a walking encyclopedia of all things musical. Founder of the guitar department at Cal State Fullerton, he composed numerous works for the instrument. Charlton was a noted performer of all members of the recorder family and his works for the instrument are, as Grimes says, "treasured by the recorder community worldwide." The Trinity Recorder Consort is based in Madison, Wisconsin, where this album was recorded. 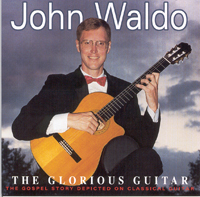 As Mr. Waldo's 1995 solo guitar album debute, The Glorious Guitar is a collection of classical guitar standards such as Maleguena, the magnificent prelude from J.S. 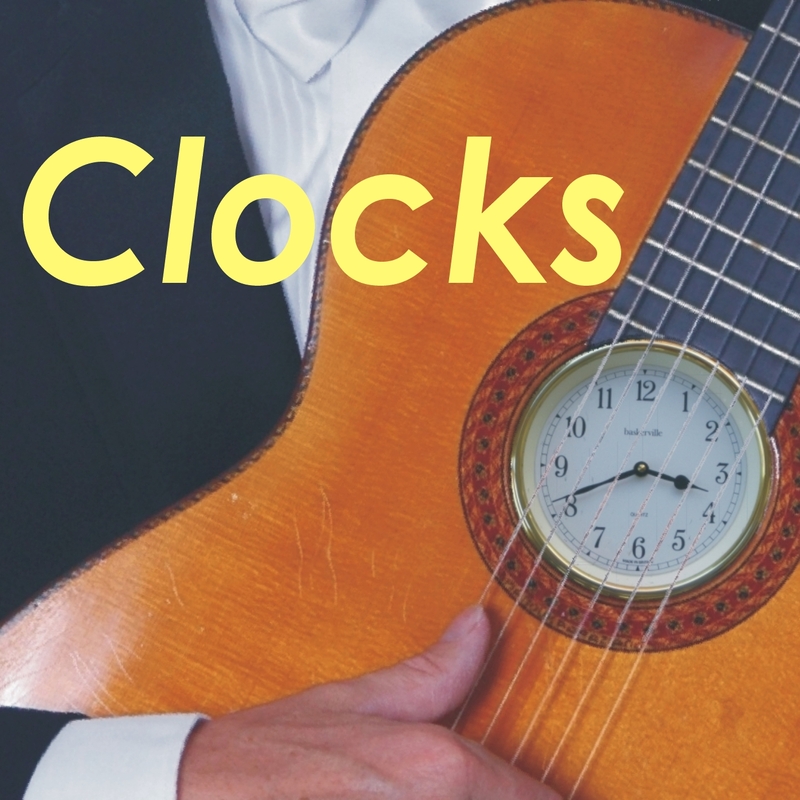 Bach's fourth lute suite (BWV1006a), as well as Frederick Baue's haunting Nocturne in A minor, and Sunburst by Andrew York. It includes Elias Barriero's transcription of Beethoven's Moonlight Sonata, Bradbury's Just As I Am, arranged by Chet Atkins, in addition to Waldo's arrangement of Ode to Joy, to name a few. Music makes the occasion. Have John Waldo make the music for your occasion. Based in Springfield, Missouri, John Waldo is an experienced professional who has performed for scores of weddings and hundreds of social gatherings. His performances have been called “exquisite”, “sublime”, “fabulous” and "impeccable”. Music sets the atmosphere for an event and is often what is remembered for the longest time afterword. Make an investment in the success of your event. Contact John Waldo for his availability to perform for you. "Thank you for lending an air of sophistication to our political event. Your playing was very well received. We look forward to hearing you again soon."